The enhanced Twitter for Blackberry app has launched in open beta, taking advantage of push alerts and adding Twitter search. 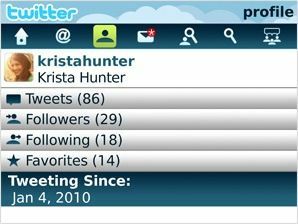 Although Twitter already has a client for the RIM phones, the enhanced application has several benefits – tying itself into the phone's other functions much more neatly. Those include showing direct messages as soon as they arrive using BlackBerry Push, posting a link from the browser and allowing upload of pictures direct from the device's camera. Other additions include better personalisation – including choosing font and size, and enlarged profile avatar viewing as well as additional in-application caching. Available for free from the test centre in BlackBerry App World, the Twitter for BlackBerry app is ready for download now.